Rural e-commerce. 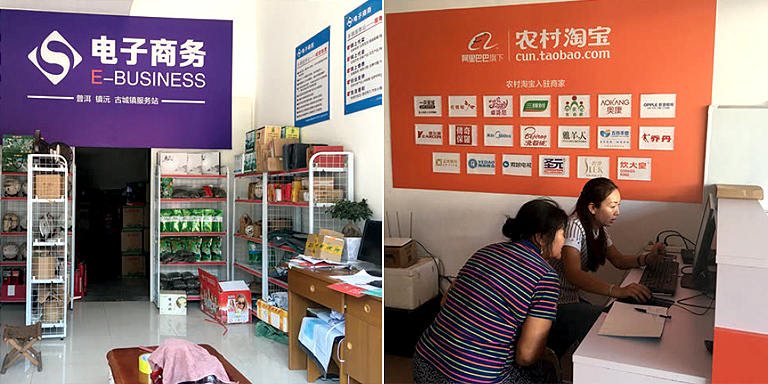 The three-tier service facility system of rural e-commerce, which includes county, township, and village-level service centers, helps boost sales of local agriculture products and allows villagers to shop online for consumer goods without leaving the village. Photo credit: Libin Wang. The internet has shown a great advantage in the integration, transformation, and upgrading of the People’s Republic of China’s rural economy, especially in the agriculture industry chain. The structure of the agriculture system in the People’s Republic of China (PRC) is characterized as “small-sized” and “highly scattered.” With family-operated farms focusing on the production stage at the expense of other value chain services, the market status of farmers is at a competitive disadvantage because of high production costs, low profit margins, and problems with nonpoint source pollution and food safety. With the rapid development of internet technology in the country since the beginning of the 21st century, a set of “Internet Plus” technologies have made influential impacts on the economic system as a whole, which has trickled down to the rural economic sector. The internet has shown a great advantage in the integration, transformation, and upgrading of the PRC’s rural economy, especially in the agriculture industry chain. “Internet Plus rural economy” refers to an economic phenomenon of applying internet technology—e.g., the mobile internet, Internet of Things (IOT), cloud computing, and big data—to improve the efficiency of the rural economic sector, such as the production, processing, and trade of agriculture products; agriculture social services (agriculture finance, agriculture precise operation, technical services); leisure agriculture and rural tourism; and farmers’ daily consumption. B2 = business origin of the supply chain, B2B = business-to-business, B2C = business-to-consumer, B2G = business-to-government, C2B = consumer-to-business. Note: Service relationships are classified as B2, B2B (a process of selling products and services to other businesses), B2C (a process of selling products directly to consumers), B2G (a process of selling products directly to government and its agencies), and C2B (logging online to make a purchase). Source: Adapted from G. Dan. 2017. Model Analysis and Suggestion about Internet Plus Agriculture. Presentation in the International Midterm Workshop on Agriculture Service System Development to Promote Rural Economic Transformation and Upgrading through Internet Plus. 21-23 July. Hua Xia International Hotel, Dun Huang, Gansu Province, People's Republic of China. The Internet Plus rural economy has become an important force of the PRC’s Internet Plus economy blueprint. First, the application of internet technology to the rural economy has transformed and upgraded many traditional industries into modern production modes, thereby enhancing rural productivity and efficiency. Second, internet technology has subverted the traditional concept of time and space, making distances smaller, time periods shorter, and information more symmetrical. This has facilitated the provision of fast, real-time, and reliable information on agriculture production, and has promoted both local and global sales of high-quality agriculture products. In efforts to promote the development of the Internet Plus rural economy model, the Government of the PRC (from national to county levels) has issued successive series of policy documents for guidance. Numerous demonstration projects have been funded for the implementation of intelligent agriculture projects using IOT applications. These include (i) the Beidou modern agriculture project in Hubei Province, which uses the Beidou Satellite Navigation System that combines high-precision positioning technology with sensor technology to realize accurate monitoring of soil moisture, farm machinery auto-pilot control, and direct seed precision planting; (ii) the intelligent rice bud production system in Heilongjiang Province, which conducts real-time data collection through temperature and moisture sensors in greenhouses to achieve intelligent micro spraying and electric shutter ventilation control; and (iii) the quality and safety traceability system of agriculture products, which applies blockchain technology in the whole agriculture value chain. Other pilot projects have focused on improving access to e-commerce platforms, mobile information, and universal telecommunication services for rural households and rural administrative villages. The establishment of these data platforms encourages data sharing on agriculture production, processing, and logistics, including information on soil testing and formulated fertilization, pest prevention and control, agriculture insurance services, product packaging, quality tracking, and e-commerce training, among others. From 2014 to 2016, the central finance department cumulatively allocated a total of CNY 6.4 billion to support the launching of a comprehensive rural e-commerce demonstration in 496 counties in 26 provinces, autonomous regions, and municipalities across the country. The Thirteenth Five-Year Plan, 2016-2020 has indicated an investment of over CNY 140 billion in building broadband villages in rural areas and remote regions. The recommendations for policies, mechanisms, and investments for an Internet Plus rural economy are as follows. Enhance the management efficiency of government departments. It is important to optimize the process of formulating policies for the Internet Plus rural economy, improve the coordination mechanism of major departments, clearly specify their roles in the formulation of the Internet Plus rural economic policies, and cultivate an internet-based thinking and working style among government departments. The catalog of both medicinal and edible agriculture products needs to be scientifically revised, and standards for their online sales established. In addition, methods should be explored for small food workshops to meet food safety requirements for the online sales of local specialty products. Improve public services. 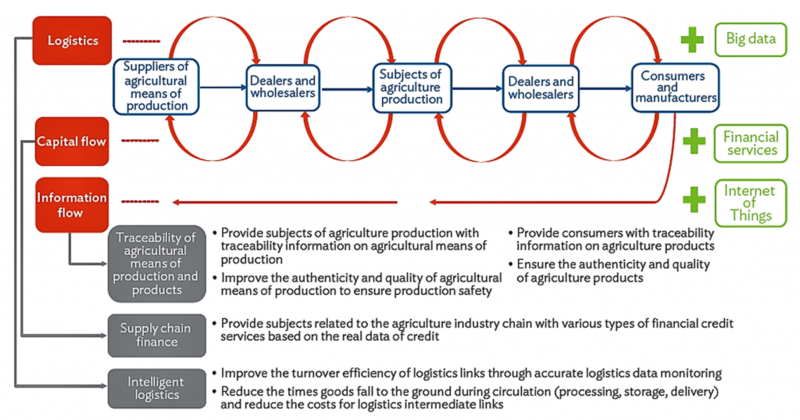 The establishment of a traceability system of agriculture product quality and safety should be expedited along with the rural economy’s big data platform. Local governments should improve not only the efficiency of public training on internet-related technologies and rural e-commerce practices but also the certification efficiency of the three criteria- certified or one geography-certified farm products. Likewise, the establishment of a market for rural property rights trading should be accelerated. Strengthen infrastructure and equipment support. The government should strengthen the construction of rural logistics infrastructure and rural information network facilities, as well as bolster incentives for R&D of agriculture IOT devices. Improve the external environment for the development of the Internet Plus rural economy. Building the underlying support system for rural internet users, especially in terms of finance and land use, is crucial. The government should regulate the market of large e-commerce platforms to promote the formation of highly efficient and reasonable market structure of fair competition among multiple giants. Increase investment of the public and private sectors in the Internet Plus rural economy. 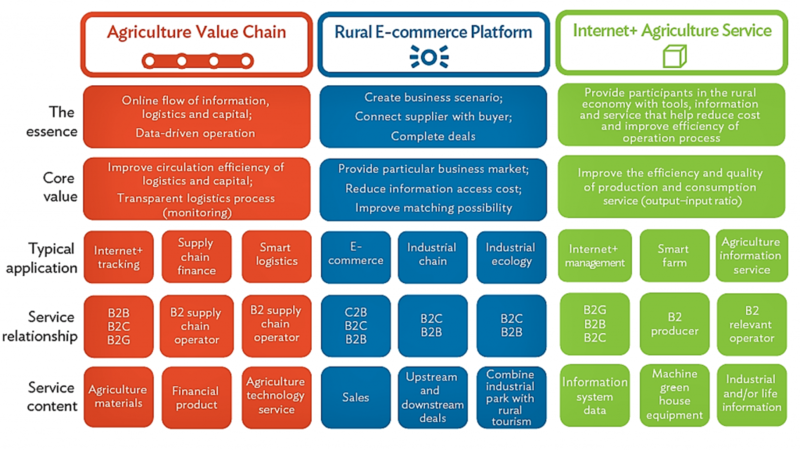 Government financial investments in the Internet Plus rural economy should focus on the following areas: villages with no coverage of rural broadband facilities; building rural roads in medium and less developed areas; providing internet equipment and application software to agriculture-related government departments; establishing public big data platforms involving the rural economy and public platform for safety traceability system for agriculture product quality; setting up cold chain logistics facilities in places of origin; and instituting a rural credit system platform. The private sector, on the other hand, are encouraged to invest in areas where an application of internet technology are already profitable—e.g., e-commerce, logistics, and distribution of rural products, agriculture IOT equipment, Internet Plus agriculture social services, leisure-oriented agriculture, and rural tourism. ADB. 2018. Internet Plus Agriculture: A new Engine for Rural Economic Growth in the People’s Republic of China. Development Asia. A Surprising Strategy for Harnessing the Internet for Development. ADB. 2016. Technical Assistance to the People’s Republic of China for Rural Economic Transformation and Upgrading by the Integration with Internet Plus. Jan Hinrichs joined ADB as natural resources economist in 2015. He is designing projects in the agriculture sector with the application of Internet-connected sensors to enhance traceability and access to e-commerce. Prior to joining ADB, Hinrichs was working at the UN FAO since 2005 where he designed agriculture value chain studies. How Ready Are We for Industry 4.0?